Sometimes you want an organic herbal mouthwash made with natural ingredients. This mouthwash recipe has worked in my household for minor mouth sores, after a tonsillectomy, and after dental surgery, not to mention all varieties of colds and the flu as well. My goal is a mouthwash that’s antiseptic and antibacterial without fillers or sugar. This is the basic recipe I use. Modify it to your heart’s content. 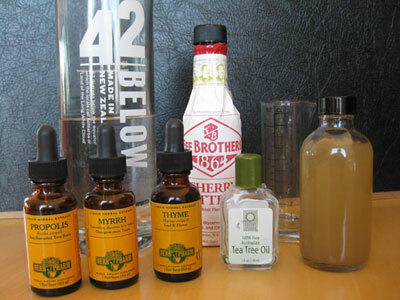 I use water & alcohol extracts instead of essential oils of everything except the tea tree oil. A little gentler compared to using essential oils especially if there are open sores or sensitive tissue involved. Note: this mouthwash is made to be mixed with water 1:1 or even 2:1. I don’t recommend using it undiluted. Rinse and spit this mouthwash out. Do not swallow it. Because it contains propolis, made by bees, if you have allergies test a small portion before using or avoid this altogether. You can make a mouthwash without propolis if you have allergies. Healthcare is a right not a privilege.